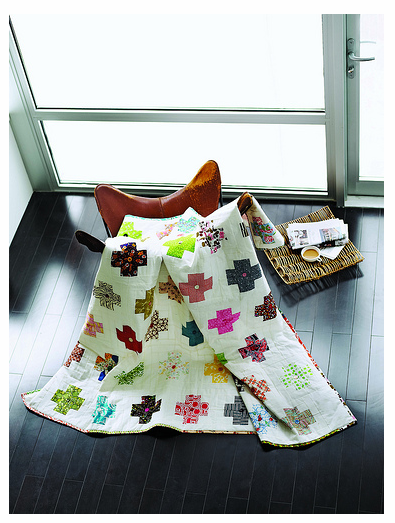 I’m so excited to share my new Log Cabin Quilting class series with Creativebug today! I filmed four hour-long workshops in at their San Francisco studio in February, they came up to Portland to visit me a couple of weeks ago and we filmed some more fun things for the class trailer, and now the first class goes live next Tuesday, May 6 (my Pearl’s 6th birthday!). Yay! Creativebug also filmed me and my friends Nancy, Heather, and Michelle here in Portland, visiting some of our favorite places – Cool Cottons, Modern Domestic, and the Pendleton Woolen Mill Store. I think the trailer they made (which has lots of Everett in it too!) really gives a sense of what you’ll learn in the classes, and how fun it is to sew simple, meaningful quilts and patchwork projects. Beautiful things that you’ll use every day in your house, or give as gifts, or just enjoy with your family. 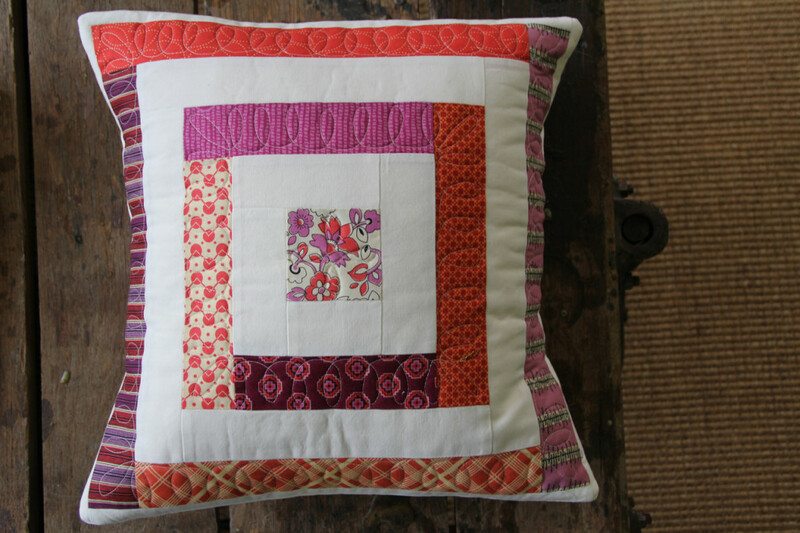 The first class teaches the very first patchwork project I ever made – Square Within A Square Pillows! 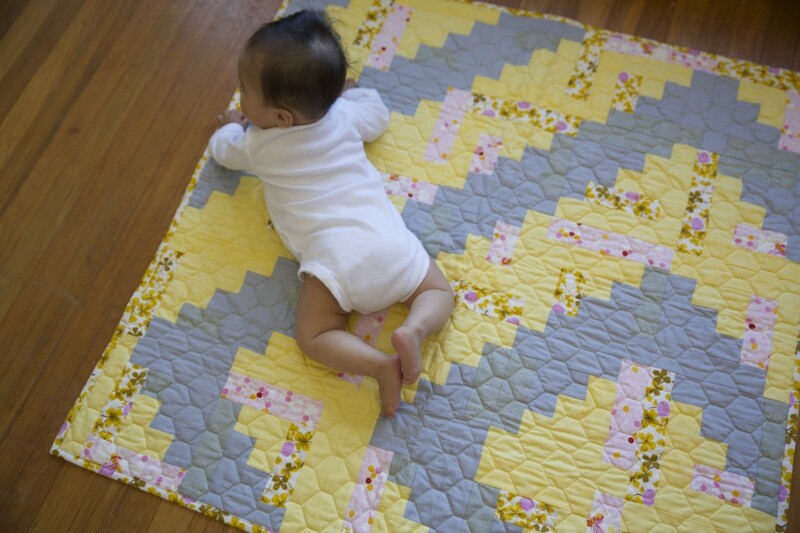 It’s super beginner-friendly, all straight-line cutting and sewing, and easy clockwise piecing, but you can make it your own with your favorite fabric and color choices, changing the width and arrangement of the log squares, and how you choose to quilt it. 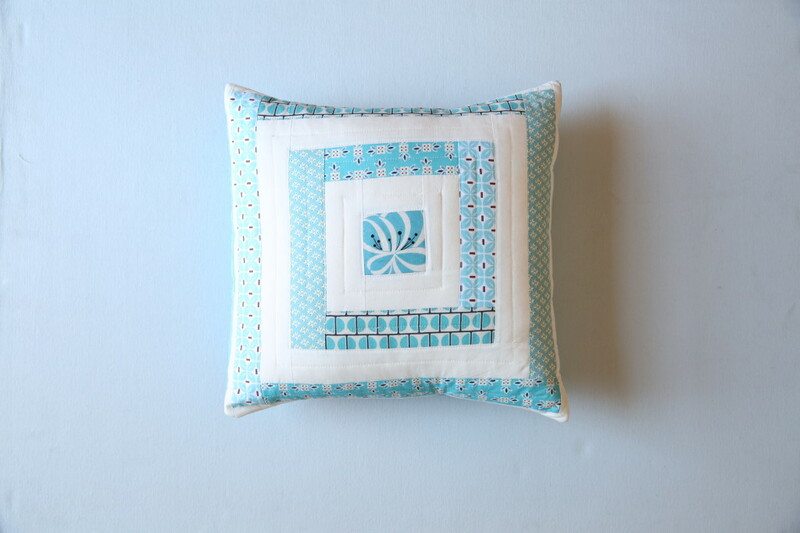 This is the “hero” pillow that I sewed start to finish for the class – pretty assorted Denyse Schmidt prints in blue, framed in serene squares of her new Free Spirit Modern Solids (lovely to sew with!) in white. I quilted it very simply, stitching concentric squares in white to reinforce and highlight the geometric piecing design. I’ll share lots more of my pillows and single-block spin-off ideas on Tuesday when the class launches! The second class, which will begin May 13, takes that same simple log cabin block and brings it back to its traditional “sunshine and shadow” arrangement around a center square, making a beautifully off-center Barn Raising baby quilt. I used Michael Miller Cotton Couture in Canary and Fog, mixing in some pops of color here and there with two of Heather Ross’ Briar Rose prints. I just love how this quilt turned out – the beautiful honeycomb/hexagon quilting is by Nancy Stovall. This class also covers some of my favorite bits of log cabin quilting history and lots of block settings to try – you can rotate and rearrange those finished blocks into wonderfully different overall arrangements with a ton of graphic pop. I really love changing blocks around to see how they relate to each other. 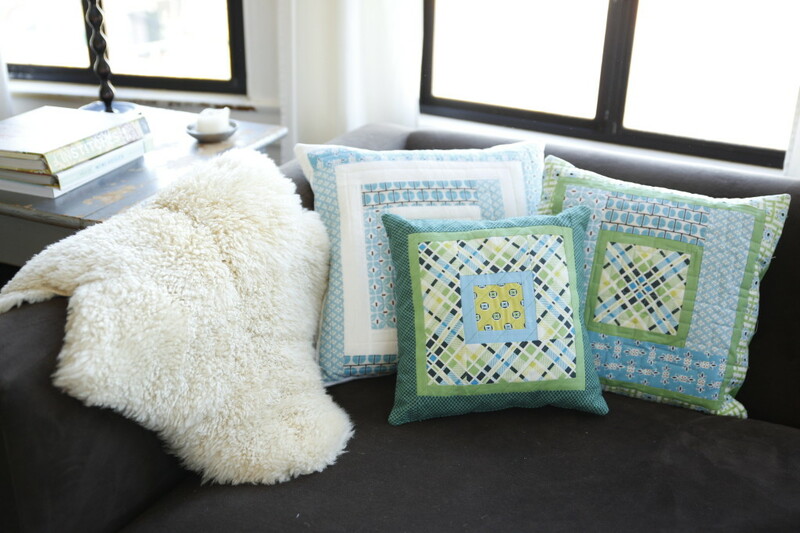 You have so much design freedom in log cabin, right up until you start sewing rows together. 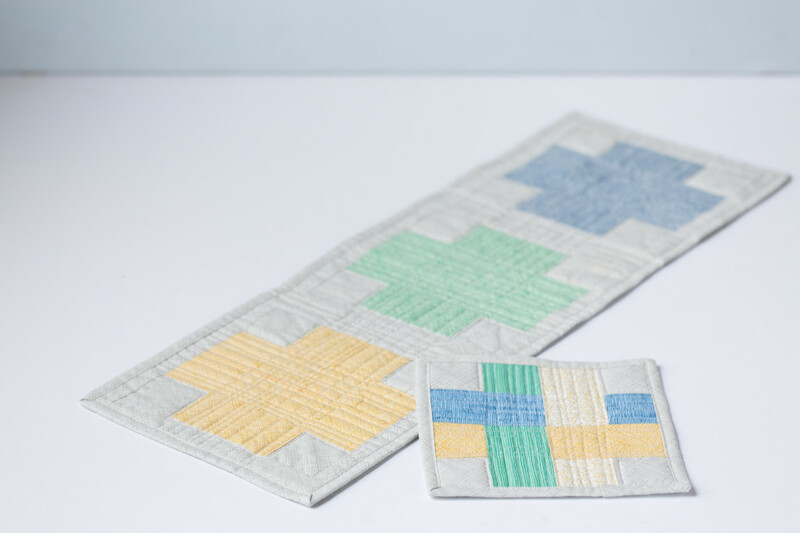 to a simple, beautiful table runner and trivet set with a slightly larger scale and setting. For this project I used all Botanics by Carolyn Friedlander – I LOVE her cross-hatch print in different colors and the beautifully imperfect lines inspired my organic straight-line quilting. This is such a quick and satisfying block to sew, whether you dip into jelly rolls or roll-ups from a single collection like I did, or just cut from yardage or favorite scraps. 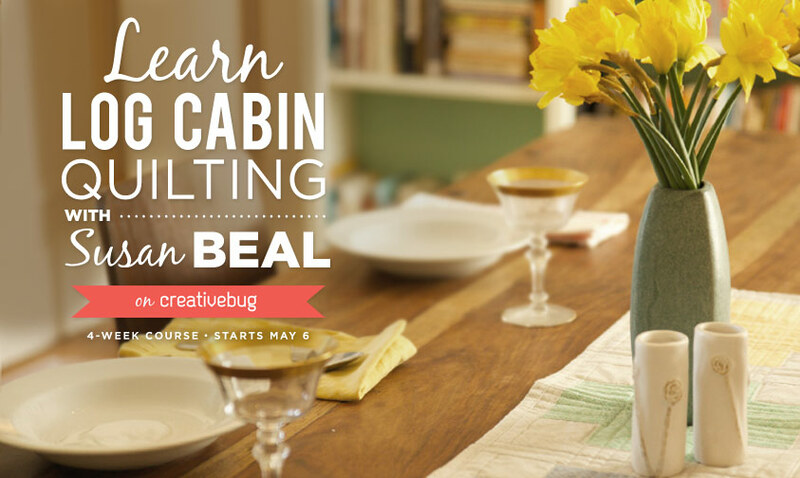 The fourth and last class, which starts May 27, takes all the log cabin piecing and design rules you’ve learned and spins them around for a completely different feel. 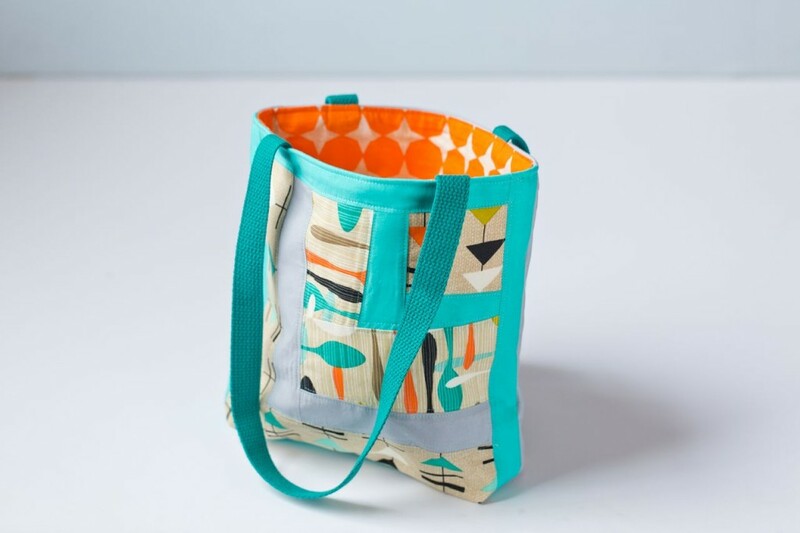 You’ll make one huge block, building outward at sharp angles instead of straight lines, and mixing distinctive prints and solids any way you like best, then cut the whole thing up into quarters that become the sides of a wonky tote bag, top-stitching for a polished finish. Lining your bag with a beautiful print (this tote bag pairs Michael Miller Cotton Couture in Luna and Fog with gorgeous mid-century prints from their Jug or Not? line) is another chance to use color and pattern! Each class will include a free live chat at 11 am Pacific on the Thursday after it goes live – I’d LOVE to see what you make or answer any other questions you might have about log cabin quilting! Check out the class page for lots more about the projects, the classes, the live chats, and all the other wonderful workshops on Creativebug. A monthly subscription is only $9.95, which gives you unlimited access to classes! I loved taking Lisa Congdon’s drawing workshops, and I have Cal Patch’s pattern-making classes stashed for when I have time for fun sewing again. I’ll be doing a Cbug subscription giveaway here on May 6 to celebrate the class launch, and I’m so excited that Erin of House on Hill Road started things off today with a post about her beautiful Denyse Schmidt pillow – and a 3-month subscription giveaway in time to jump in and sew first thing Tuesday! Enter with a comment on her blog post between now and Sunday. Happy sewing!!! See you next week! Sew Mama Sew giveaway day – my log cabin quilting class + YOUR favorite supplies! make it: asterisk sunglasses case!